My Knitted Chair’s upholstery forms patterns and the texture is comfortable to sit on. As you sink into the seat it connects with and supports the seated body. The frame is formed from tubular steel, the fabric is wrapped around the frame and the legs are turned Elm fitted into sockets. The upholstery is lovingly knitted on broomstick handles by me. 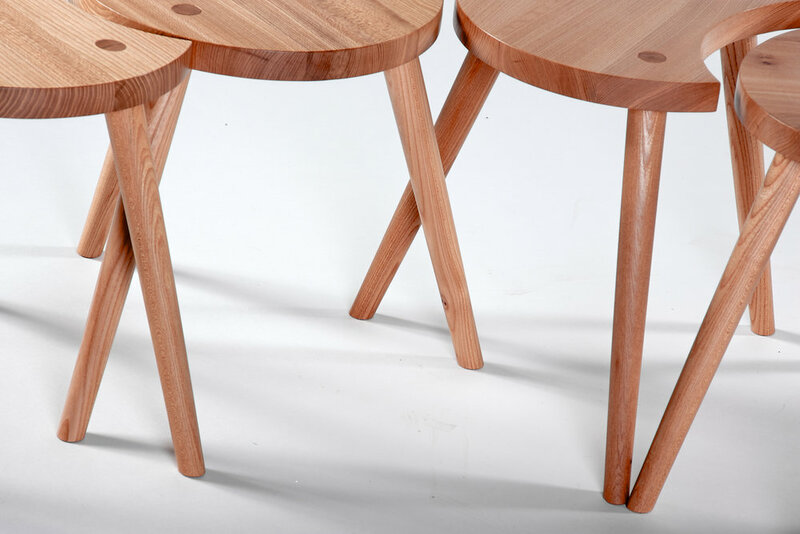 My family of ‘Bare Milking Stools’ are constructed in the traditional way with wedged mortise and tenons handcrafted in Elm. They celebrate a craft derived from a functional need and have a personal reference to a stool I use and love. 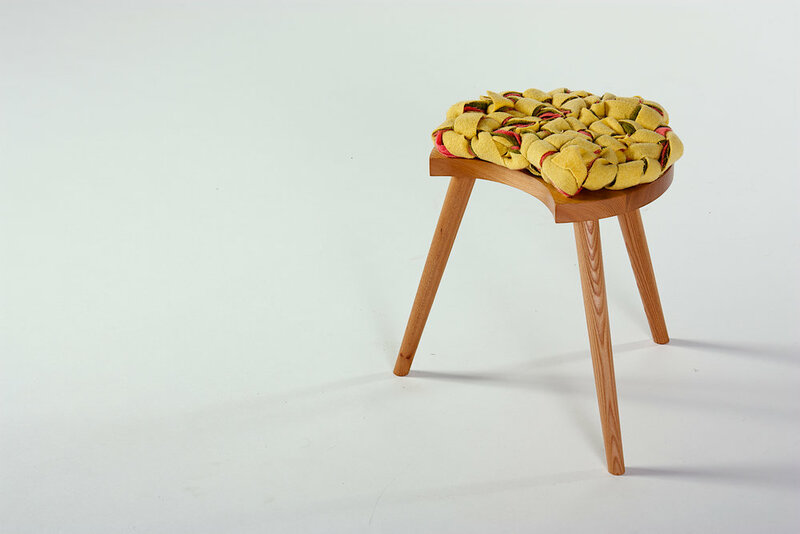 My family of upholstered milking stools are constructed in the traditional way in Elm and wool. The cushions are recycled blankets felted and dyed to natural and bright colours, and knitted and woven on looms I constructed during my experimentation of materials and processes. A natural form in our paperless society. The lines of this workstation spiraled from my observations of trees and the repetition of the same form in different scales. Constructed with steam bent Ash and joined with large copper nails and roves. The strength is built into the piece by the triangulation of the joints. My most treasured creation, this Elm desk expands, fits any size room and can stand alone. This piece aims to aid clarity of mind for seamless discrete storage that uses sensitive curves to encourage interaction and versatile domestic uses. The inspiration for these practical and sculptural objects comes from the Norfolk riverbank reeds and my connection with steam-bending processes and clinker like construction. These steam-bent Ash and Brass vessels are joined with traditional boat-builders copper nails and roves. If you catch these flowing forms in the wind they will rock like boats. My bangles are stripped back, sculptural and tactile to ware. They wrap and twist around the wrist. There great fun to make, I use my unique craft skills I developed whilst refining my trug range to bend and join these pieces.